The Field Guide for APS is intended to provide an agency or an individual APS supervisor with an organized system to ensure that the new APS worker gains the experiences and formal training needed to be an effective professional. This guide outlines nineteen (19) Knowledge Areas identified as comprehensive for APS field work. These Knowledge Areas include basic field skills, as well as working with unique types of cases/situations. 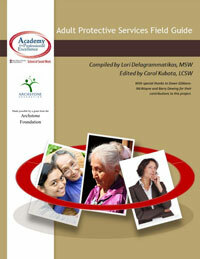 The Field Guide for APS is available for download below.